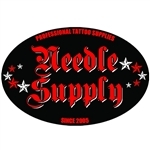 For clothing and swag, Needle Supply offers company logo bumper stickers and tee shirts in a variety of colors and sizes of regular and tall, both up to 4XL. These heavy-duty, double-stitched tees come in blue, red, black and white, with the company logo printed proudly on the front and the website address printed on the back. Sullen Art, an art-driven clothing brand out of Huntington Beach, CA, is co-owned by a professional tattoo artist with the goal of artistic collaboration with like-minded artists around the world. Sullen's offerings include T-shirts, V-necks, tanks tops, lanyards, baseball caps and tattoo artist supply backpacks and travel luggage. Remember that all orders of $99 or more receive FREE shipping. 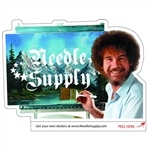 Needle Supply "BOB" Sticker 4x3"
Needle Supply "BOB" Sticker 5x3"
Needle Supply "BOB" Sticker 6x4"
Needle Supply "BOB" Sticker 8x6"
Needle Supply 341-White Sticker 10x6"
Needle Supply 341-White Sticker 6x3"
Needle Supply Logo Circle Sticker 3x3"
Needle Supply Logo Oval Sticker 4x3"
Needle Supply Logo Oval Sticker 6x4"